Size: 661 sq.ft. - 1017 sq.ft. Wadhwa Atmosphere is a world of comfort and luxuriousness in the dream city Mumbai being developed by The Wadhwa Group. In their every project the designing concept is followed by Vastu Shastra principles. Wadhwa Atmosphere sprawled over the land parcel of 12.8 Acres with configurations of 2 BHK & 3 BHK bountiful 3 high rise towers that are designed to unmatched perfection. Wadhwa Atmosphere brings you a place where you and your family live in a peaceful atmosphere away from commotion of city. Wadhwa Atmosphere allows us to obtain the best units at very reasonable costs. The keys will be handed over in October 2019. These blissful 2 BHK and 3 BHK flats are crafted with the sufficient Carpet Area of 663 Sq.ft to 1056 Sq.ft. 2 BHK units are available at 1.57 Crore and 3 BHK at 2.55 Crore. Every room is crafted with Vitrified flooring, apartments are having large balconies with unobstructed views of the surroundings, Fully Air-conditioned units, Designer Doors, illustrious kitchen design with granular kitchen platforms, indoor and outdoor Hi-tech safety, Optimum cross ventilation and many more. The buildings A, B and C are standing over multi-level podium parking. Tower A is composed with 240 apartments, Tower B consists of 238 apartments and 242 apartments in Tower C where each floor of the towers comes with 4 modern best in class apartments. Wadhwa Group is a Mumbai based real-estate development company. The group was established in the year 1969 by Mr. Vijay Wadhwa. The developer has always come up with a project that includes ample greenery space around the complex. They develop residential and commercial properties where their completed developments in Mumbai include The Palm Beach Residency, Anmol Pride, Capital, Trade Center, Glenmark, and Madhupuri. Their ongoing properties are Atmosphere, The Address, Courtyard, W54, Evergreen Heights, Platina, Solitaire, Anmol Fortune, Panorama, and Promenade. Very soon a new project is going to launch named Wadhwa Wise City in Panvel, Mumbai.They always make sure to provide right property to their buyers or investors. Buying home in the central location of Mumbai is like dream come true. Mumbai is very scrumptious city in the Maharashtra state and there is no other city like. 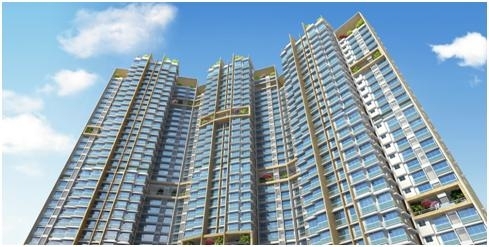 Mulund Mumbai has welcomed various residential top-class projects and the one of them is Wadhwa Atmosphere. In today's time it is really important to save time from your busy days that this project does by making your commutes convenient that you can easily travel to nearby landmarks and offices through all kind of public transports. As it is being launched at the very central location so it excels out the more advantages to you. The Atmosphere project is settled between Mulund & Nahur location at Goregaon Mulund Link Road near Fortis Hospital in Mulund West, Mumbai – 400080. The Atmosphere Mulund is going to give you a truly memorable experience of living and other necessary facilities too: - Multiple Sports facility, Amphitheatre, 24/7 Water Supply, Jacuzzi, RCC Framed Earthquake Resistant, Day Care Centre, 24/7 security, Power backup facility, Joggers Track, Landscape Garden, Play area for kids, Gymnasium, Meditation Centres, Spa and Sauna, Rain water harvesting system and sewage water treatment. Schools/Colleges – DAV International School, J.J Academy High School, NES International School, Wonderbeez, Mulund College of Commerce, Holy Angel's High School and Junior College & VG Vaze College, Mulund Vidya Mandir. Banks/ ATMs – ICICI Bank, Bank of Baroda, IDBI Bank, Citibank, HDFC Bank. Restaurants - Dominos, Gopalas Banquet, Exotic Flavours, Spice lane Resto & Bar. Movie Theatres - PVR Cinema, R Adlabs and Jawahar Talkies. Shopping Malls/Supermarkets - D-Mart, Shoppers Stop, Nirmal Lifestyle Mall, R-Mall. Hospitals - Fortis Hospital, Ashwini Hospital, Vertex Hospital, Hira Mongi Navneet Hospital.